The state of Minas Gerais in Brazil has been famous for fine colored gemstones for nearly 300 years, especially the best Aquamarines and the rarest topaz known as Imperial Topaz. Topaz is a gem with excellent hardness -- 8 on the Mohs scale -- but most topaz found in nature is an uninspiring color, either colorless or an insipid yellow or brown. Some of this common topaz can be irradiated and heated to produce the cheap blue topaz that is ubiquitous in commercial jewelry. The only topaz that has real value in the gems world is precious topaz, known in the trade as Imperial Topaz. Imperial topaz is golden to golden-orange to orange in color, with especially rare specimens occurring in pink, pinkish-red or violet. Natural pink imperial topaz is one of the rarest of all jewelry gemstones. It is essential that the color of imperial topaz be completely natural. Some of the imperial topaz colors can be simulated by irradiating colorless or weakly colored topaz. You will see these treated stones selling for a few dollars a carat from auction sites. Unfortunately the color tends to fade quickly when exposed to sunlight, so the fake imperial topaz is a poor value even at its modest price. Some of the pink topaz in the market has been coated with metal oxides similar to that used for cheap "mystic topaz." We have recently acquired some superb natural pink imperial topaz, and have sent samples to GIA to confirm they are completely natural. Most of these rare gems are in smaller sizes -- the largest is 2.47 cts -- so we have created some lovely suites by combining them with fine aquamarines from the same region of Brazil. The color is reminiscent of pink diamond or pink sapphire, and they have wonderful sparkle and luster. Truly a rare gem for the discerning collector. This month we feature fine suites and matched pairs, including some rare Pink Imperial Topaz that we have just added to our collection. A superb matched set of Imperial Topaz and Aquamarine! Pink is an extremely rare color in Imperial Topaz, and the 2.47 ct pink topaz center stone has been certified by GIA. The Aquamarine pears have a total weight of 2.61 cts with dimensions of 7 x 7 mm. The set is very well matched and can be used to create a ring and earrings, a pendant and earrings or a 3 stone ring or pendant. This is a very special suite for the fine gem collector. A wonderful matched set of Imperial Topaz, Aquamarine and Diamond. Pink is an extremely rare color in Imperial Topaz, and these fine pinks are completely untreated. The Aquamarine trillions have superb saturation and a deep tone, making them very special as well. The set is very well matched and will make a stunning pair of drop earrings. The Pink Topaz are about 7 x 5 mm while the Aquamarines are about 7 x 7 mm. The Diamonds are 10 points each (3 mm). A lovely matched pair of fine Peridots from Pakistan. A bright and brilliant green, these well-matched 10 mm rounds are completely clean and perfectly cut. These will set up beautifully in your earring design. Guaranteed natural and untreated. A gorgeous matched pair of the finest quality Royal Purple Garnets from Mozambique! This is beautiful clean material with a vivid open color. Under cool light, these gems display a rich purple hue, changing to cranberry with magenta flashes under incandescent light. These rare gems will set up beautifully in your jewelry design. Guaranteed natural and untreated. Petalite is one of the most popular of the colorless gems. It has reasonably good hardness (6.5) and tends to display a pure white without heat treatment. This matched pair of petalite pears is completely clean and will make an impressive pair of drop earrings. Guaranteed natural and untreated. A lovely suite of cinnamon Tourmalines with a 12 point diamond, perfect for a pendant design. The large pear shape Tourmaline is 5.93 cts, with dimensions of 15.30 x 10.10 x 7.40 mm. The fancy shape Tourmaline is 2.08 cts, with dimensions of 9.72 x 7.45 x 5.21 mm. Guaranteed natural and untreated. 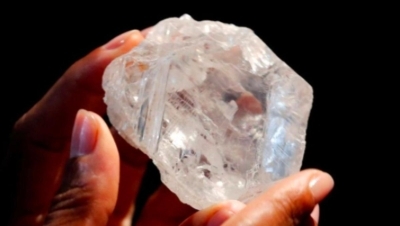 Lucara Diamond Corp has finally sold the 1,109 carat Lesedi La Rona diamond, for $53 million to Graff Diamonds. The enormous uncut diamond had been offered at auction at Sotheby's in London last year, but failed to sell. It had been expected to sell at a price around $86 million. This rare diamond, nearly the size of a tennis ball, was mined at the Karowe Mine in Botswana. It is second in size only to the 3,106 carat Cullinan diamond found in South Africa in 1905. The Cullinan was cut to form the Great Star of Africa and the Lesser Star of Africa, which are set in the Crown Jewels of Britain. The President of Tanzania, John Magafuli, has ordered the military to build walls around the tanzanite mines and directed the central bank to buy tanzanite to boost reserves, the latest developments in a dispute with mining firms over alleged tax evasion. The government accuses mining firms of cheating Tanzania out of its fair share of mineral wealth through tax dodging and smuggling, allegations they deny. President Magufuli ordered the military to build walls with security cameras and checkpoints around all tanzanite mining concessions in northern Tanzania "to control illegal mining and trading activities." The largest tanzanite mining company is TanzaniteOne. It was founded by Richland Resources, a gemstone development and mining company who were listed on the London Stock Exchanges AIM market in 1994. In 2014 TanzaniteOne was sold to a private company, Sky Associates Group Ltd., who are now the current owners. The reason is that there are 2 types of zircon: "high zircon" and "low zircon". High zircons have a hardness of 7.5, while low zircons have a rating of 6.5. The zircons used in jewelry -- blue, red, white and honey colors -- are high zircons. Low zircons are always green in color, and they have a lower hardness rating because their crystal structure has been altered by thousands of years of irradiation from their own trace elements. These low zircons are quite rare, and are valued by collectors. Tanzanite is a medium-hard gem, with a Mohs hardness rating of 6.5 to 7. So it is not as tough as ruby or sapphire. But it is quite popular as a ring stone, and most tanzanite owners have had good experience with the durability of their tanzanite rings. If you are active, or tend to be hard on your jewelry, consider a protective setting or choose tanzanite for a ring that you don't wear every day.